Four members of the defunct Your Black Muslim Bakery charged with kidnapping and torturing two women in 2007 appeared in an Oakland courtroom Wednesday, in an effort by defense lawyers to separate their cases into different trials. Yusuf Bey IV, 23; Yusuf Bey V, 22; Tamon Halfin, 22; and Richard Lewis, 25, all appeared before Alameda County Superior Court Judge Morris Jacobson for different motions to separate the four suspects for trial. Jacobson agreed that Halfin and Bey IV should proceed apart from Bey V and Lewis. But a motion to separate Lewis from Bey V by his attorney failed. Jacobson said that motion will have to be heard when their trial starts later this month. The kidnapping and torture charges stem from a 2007 incident in which the suspects are accused of using a fake police cruiser to capture two women in hopes of stealing cash. Police and prosecutors allege that on May 18, 2007, bakery members used a Ford Crown Victoria outfitted to look like an undercover police cruiser to lure, kidnap and torture two women. Along with the four former bakery members ordered to stand trial, a fifth bakery member originally charged in the case, Joshua Bey, 21, agreed to a plea deal last year in exchange for his testimony against the others. An Oakland police officer testified last year during a preliminary hearing that one of the alleged victims told police she and her mother had been pulled over by what they thought was a police car and were apprehended by men carrying guns and wearing masks. 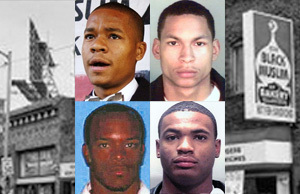 Police said they eventually connected the bakery members to the kidnapping, in part through the Crown Victoria registration, which was registered to a Bey family member.